Revolved cut feature is one of the very useful solidworks feature tool, which helps to remove materials from 3D models possess axis symmetry. Revolved cut removes materials by revolving a closed profile a along an axis. You can access this solidworks feature from both command manager and menubar. Extrude cut feature also helps to remove materials from 3D models, but only in linear manner. 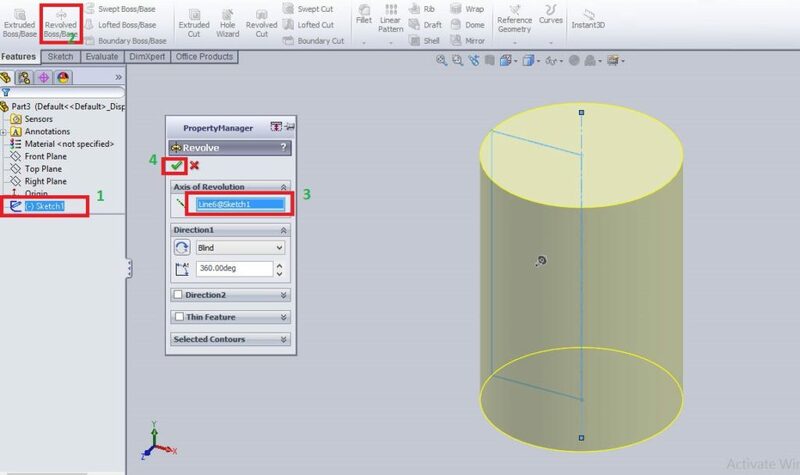 Let us learn how to use the revolved cut feature in solidworks. Here I am going create 3d cylinder with one end side internally stepped as shown in the figure below. The dimensions are rough and you can select any dimension as your comfort. Note: This is just tutorial showing how to use revolved cut tool, not showing any product drawing or designing in it. If you are advanced SolidWorks user please avoid it. This Solidworks tutorial is for beginners, students or people likes to learn about SolidWorks. Open the Solidworks by double clicking on the icon from the desktop. Then open a new part file for creating sketches. If you don’t know it, read how to create new part file here. Select any plane (e.g. front plane) and normalize using “Normal To” button. Also Read SolidWorks Heads-up Toolbar on this blog. Then you just create rough rectangle with one edge on the centerline as shown in the figure below. If you wish to give certain dimensions, use the smart dimensions from the sketch command manager. Select the “front plane” from the Featuremanger design tree. Then click the mouse right button and click on the “Normal To” button. Create a closed profile like on the below image. Then exit the sketch and go to feature manager command manager. Select the “Sketch 2” in the Featuremanager design tree and select the “Revolved Cut” feature from the command manager. Here, I already drawn the profile through the centerline. So “Line [email protected]” automatically select as axis of revolution. You can see the preview of revolved cut feature in the below image. You adjust the revolution angle. Here I set “360 degree” for full revolution cut. Then click on the “green tick” button to complete the revolved cut. Direction 1 or 2: Here you can set the revolve cut type, reverse the direction and direction angle. The revolve types available are blind, up to surface, up to vertex, offset from surface and midplane. More Solidworks Tutorials are coming soon! I am currently studying HNC Mechanical Engineering, my background is in AutoCAD. Study has now moved onto Solidworks, which I have never used and has caused me much anxiety on how I would complete the assignment. Since discovering these tutorials, my angst levels have decreased as these are really helpful. Thank you very much and keep looking for new solidworks tutorials.